While my brother and his fiance were here, they asked me to to take some photos of them. Okay, that's not true. I asked them if I could take some photos of them. And then I made them go outside on a hot July afternoon and let me take photos of them. To make it up to them, I made them a mini-album with the pictures! I found a cute 4x6 photo album at Target - turquoise linen with a bright green (chatreuese) elastic band. I picked the best pictures - some funny, some "serious", and then made 4x6 "layouts" with various photo-related quotes and word art. I think it turned out pretty cute - here are a few pages! I will post credits at the end - post a comment if there is a particular digital element that you would like to know about. Asher decided to interrupt our session for a quick game of "yellow ball". I won't post all of the 28 photos/pages, but you get the idea! The last photo of them is my favorite. :) Thanks for looking! Just Because kit by Kim Broedelet; Word art by Ali Edwards, Jodi McNally, Audrey Neal, Paislee Press, and Taylor Made; photo masks by Annie Manning and Katie Pertiet; camera sticker by Audrey Neal (Photogenic kit); white paint by Emily Powers and Oscraps (Hopes & Dreams Collab); photo actions by the Pioneer Woman (Slight Light, Boost, Edge Burn). I was delighted and flattered a few months ago, when a decorating firm contacted me about using some of my photos in a restaurant! They were decorating the Wood Grill Buffet, a new restaurant in Hesperia, CA, and asked if they could use two of the photos I had taken in Hesperia. Of course, I agreed! I was in Hesperia again this week, and took the opportunity to have lunch at the Wood Grill Buffet - and see my photos! - I took over 10,000 photos this year with my Canon Digital Rebel XTi. - My photos span over 5 different countries and 9 states. 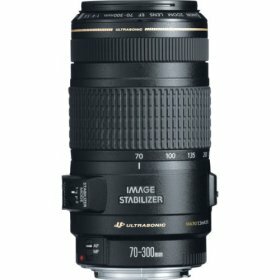 - I bought a 75-300 mm zoom lens and a fixed 50 mm. - Mike bought me the 430 EX flash and a remote! - I took an online photography class, and learned about ISO, aperture, and shutter speed. - I had photos published in a calendar, requested for use in a restaurant, and for an online service. Whimsical Wonderland kit by Tiffany Brady, Rachel Young, Jaime Young; Simple Abundance alphabet by Audrey Neal, Molly DeCrow, Kathryn Wilson Designs, Emily Powers; Photography word art by Ali Edwards; Camera charm from Artemia Collab kit. The photo on the right was taken in Haiti - I took some great shots that day, but gosh, was it hot!! I took several shots with different settings, but I like this one the best. ISO at 100, Shutter speed at 1/320. I used my 75-300mm lens, fully extended. I changed the white balance to tungsten, which seemed to make the most difference. (I tried daylight and auto-WB, but they didn't have the same definition.) I sharpened it just a bit in PSE. I found some great tips and a "moon photo calculator" here - check it out! 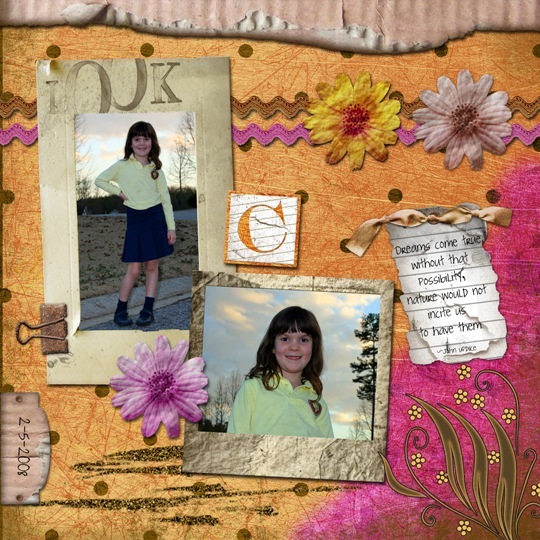 I have not been feeling inspired, so was eagerly waiting for my "Design Your Life" class (Cathy Zielske - Big Picture Scrapbooking) to start, when Ali Edwards posted that she was going to take us through a version of her "Week in the Life" class on her blog this week. I decided to join the fun! I have been keeping notes each day and have been having a lot of fun taking pictures of random, everyday stuff! Here are some of my pictures so far... I also have some posted on my Flickr page. Anyway - posted some pictures on my Flickr page! 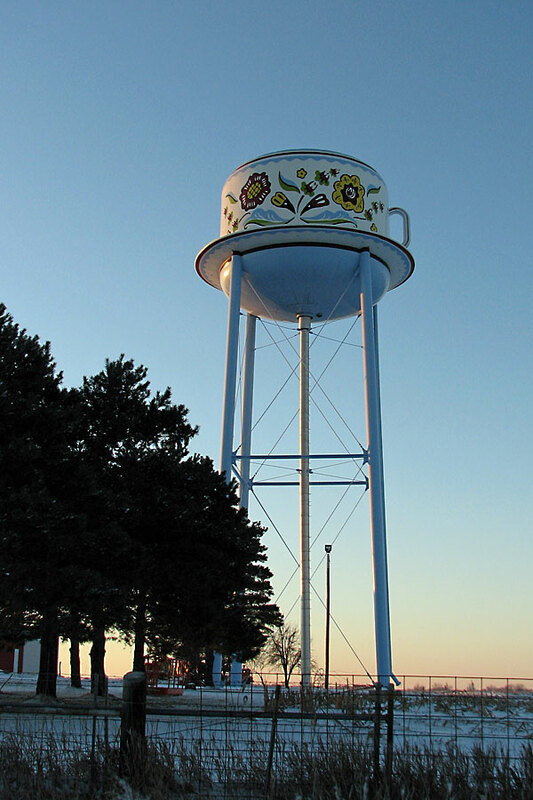 I work for the nonprofit Community Resource Group, which helps rural communities with water and wastewater projects. I’m writing to you about your water tower photo on Flickr. 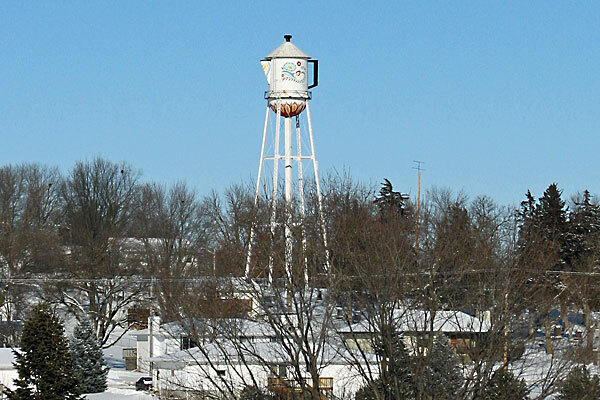 We would love to use your photo in our water towers calendar, which we sell to raise funds for our organization. Would you consider letting us use your photo in the calendar? Full credit would be given, and we’d like for you to give us a bit more info, such as where/when the photo was taken. We will be happy to send you a complimentary calendar as a thank you once they’re printed. Would I consider it???? When I responded to say - of course - she replied and said they were interested in the coffee cup tower as well. In case you're interested, I took these in Stanton, IA. 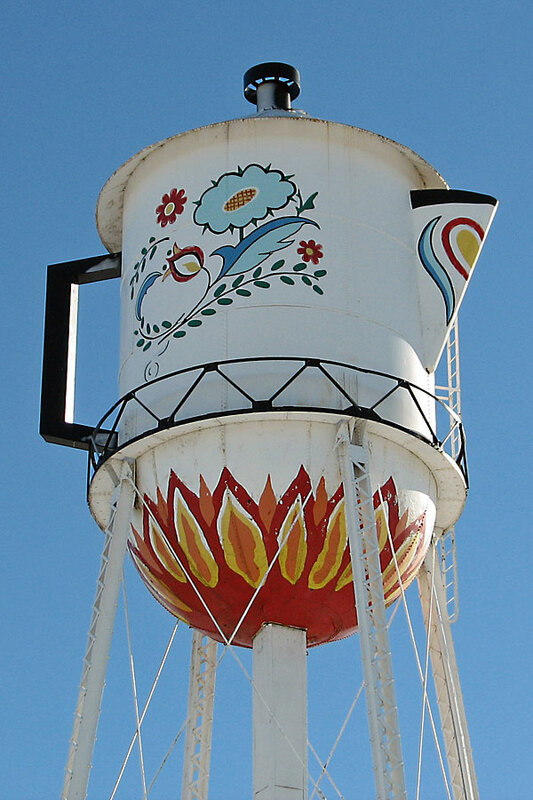 Virginia Christine, Mrs. Olsen from the Folgers commercials, was born in Stanton, thus the coffee pot tower in her honor! With the exception of one hill, Stanton is very flat, so you can see the towers from just about anywhere. The Coffee Cup tower is 95' tall - and would hold 2,400,000 cups of coffee. Oh - and guess what!? I love taking pictures - I take a lot of them, hoping that maybe there will be one that really jumps out... and over the last few days, I am happy to have gotten a couple of those! 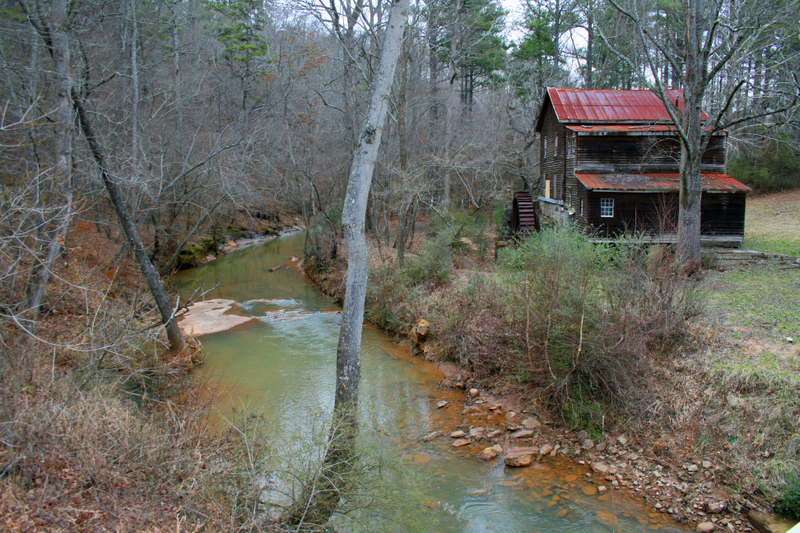 I saw an old grist mill when Mike and I took a different way home on Saturday. On Sunday, I went back over there to take some pictures of it, and discovered that there was a lovely dam and waterfall behind it. I am so glad I did, since a new park is being built there, and while they may keep the old dam there, it won't look the same as it does in my photos. On Tuesday night, I saw the kids playing outside, and grabbed my camera on the way out the door... got some great shots of them, especially of Chelsea with the sun setting behind her. 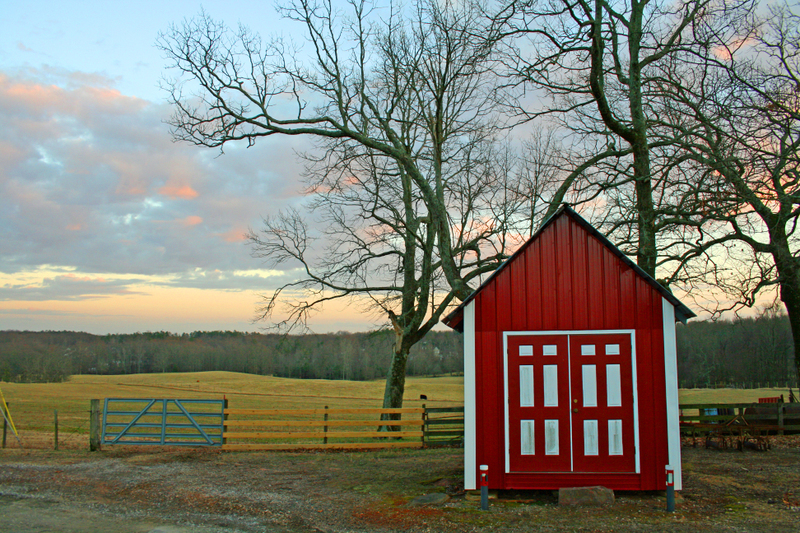 Then, on my way to the store, I stopped and took some shots at a farm nearby - I have always thought it was pretty there, but never had my camera with me. I happened to meet one of the owners of the farm, an elderly man, and he seemed quite happy at the idea that I wanted to take pictures of his fields.